YouTube and video marketing can seem complicated and frustrating, but it's really simpler than it looks. You just need to focus on what works best to tell your story to your target market, and not worry about expensive video cameras or software or SEO jargon. Here's a few guides that will help you that are based on my success using video to market other businesses like yours. Put some video marketing mojo to work right away! 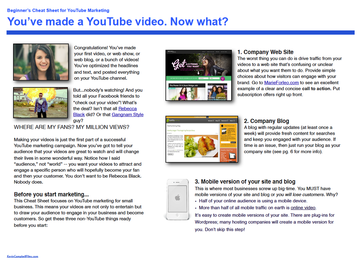 Want to see how inbound video marketing works? This easy-to-follow .pdf will show you how anyone can this, and includes some great links to online resources, too! CAN CUSTOMER STORIES ON YOUTUBE GROW YOUR BUSINESS? We've got a whole series of video blogs YouTube channel: "YouTube Tactics to Grow Your Business." Take my courses on Curious.com! Learn how to use video marketing, even if you're just a beginner.